Size: 20″ long, 15″ deep, 3 1/2″ thick Colour: Light grey only. 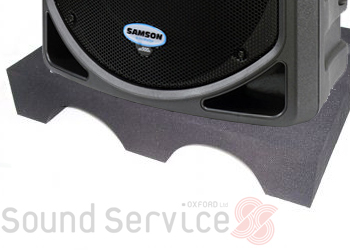 The Music Isomat is designed to isolate large heavier speakers from floors to improve the quality of music being produced and reduce noise and vibration nuisance from travelling through floors and walls. Ideal for gig equipment or a subwoofer. The Music Isomat is a heavy duty isolation mat. It can withstand 140kg (308lb) and is designed to isolate your home cinema subwoofer, gig or PA equipment. The mat is 20″ (508mm) by 15″ (381mm) and 3.5″ (89mmm thick.) They can be used on their own or placed together if you have a large area to isolate. Available in light grey only. If you are looking for smaller monitor isolators please click HERE. Is the foam flame-retardant? Yes. It meets the requirements of schedule 1, part 1 the Furniture and Furnishings (fire) (safety) Regulations 1988 (amended 1989). Also no CFC’s of HCFC’s are used as alternative blowing agents in the manufacture of these foam grades, all water blown technology is used. No brominated compounds are used in the manufacture of these foam grades.